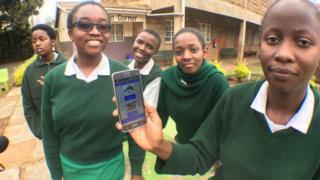 Kenyan schoolgirls are building apps to end ticket queues and transform organ donation, with the help of new mentor programmes promoting women in tech, writes the BBC's Anthony Irungu. Sixteen-year old Harriet Karanja had been waiting a while in queue to buy a bus ticket in Kenya's capital, Nairobi, when someone else who was waiting was robbed. When she retold her tale at school she found out her classmates had experienced the same problem. What if, she asked, they could get rid of the queue for the tickets altogether? She got together with four other school friends to make an app to buy a bus ticket, working with the support of a mentor as part of a scheme backed by Kenyan mobile phone company Safaricom. They tested out a prototype version of the app on a long-distance bus across Kenya. "The app takes you to the bus stop you prefer using GPS technology so you will only need to go to a bus stop to board a vehicle but not to wait for a vehicle." They called it M-Safiri - which means "traveller" in Swahili. Soon, the five young students were on the road themselves, travelling from Nairobi to San Francisco in the US to present their app at a global technology competition for schoolgirls. The five, under the team name the Snipers, made it to the finals but missed out on the $10,000 (£8,000) top prize. That went to a group of Mexican school girls who made an app which helps people volunteer to do social work. But although the girls did not receive funding to develop the app beyond the prototype stage, they are hoping they can pursue private investment once they leave school. But the experience could make a far bigger impact in their lives than the prize. The girls have plans to transform their team into a technology company once they graduate from high school and are looking at patenting and rolling out the app. Snipers teammate Priscilla Wambui says that having the support of a mentor was vital. "We didn't know how to code, pitching, writing a business plan, all this takes long to learn and it was a big problem for us," she said. Are Rwanda's buses first stop towards a cashless future? What difference will Obama's plan to bring power to Africa make? The Snipers are not the only girls who have been helped by an app-making mentor. Teacher Damaris Muteti learnt how to code on a course backed by US IT giant Intel. So when she noticed her final-year high school student, 17-year-old Caroline Wambui, had come up with an idea to connect organ donors, patients and hospitals, she stepped in to assist. "She had a good idea, and I thought if I could help a young girl, then she would also teach other women about technology, and that would help a lot of women not only in Kenya but Africa as a whole to know how to use computers. "That would be a plus for our community." Ms Wambui's idea was born out of a personal tragedy. "My uncle died due to lack of a kidney match, it took a long time to find a kidney on the black market, it was a tragedy for us, and didn't want another family go through the tragedy that we went through," Ms Wambui said. The app would allow you to know if you are eligible to donate an organ and to check the medical requirements of the patient in need. The two built a prototype on a tablet and have found partners to work with. But they have come up against an obstacle to rolling out the app. They are waiting to see if a law will be passed to make it legal for people to donate organs after their death. Currently, illegal organ sale cartels are thriving - it is a lucrative business where willing sellers are operated on in back-street dispensaries. If the legal issues are resolved, Ms Wambui could make the biggest impact - meaning other girls like her do not lose their relatives. But her story is rare. A World Wide Web Foundation study found that only 20% of women from Nairobi's slums - like Ms Wambui - are even connected to the internet. That's compared to 57% of men. Mentorship is being hailed as the way to improve that situation.